DigiWeather works on Yahoo! Widget Engine and displays current weather information and weather forecast for any major city from Romania. In the lower side displays weather alerts or useful information. The widget can be resized to display only the forecasts or only the current weather. 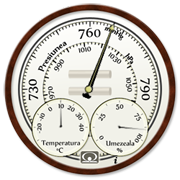 DigiStation is my latest widget, and simulates a weather station that displays the current atmospheric pressure, current temperature and humidity. The main challenge here was to build it for multiple widget engines: Windows Sidebar Gadgets, MacOS Widgets, Yahoo! Widget Engine and even Flash (for web pages).